Living a Fit and Full Life: Malt Shop Cookies Made with No Artificial Preservatives are the Perfect Holiday Treat! 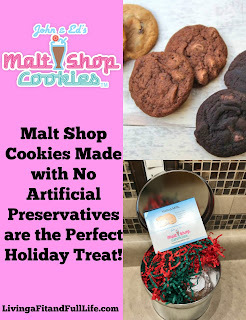 Malt Shop Cookies Made with No Artificial Preservatives are the Perfect Holiday Treat! Malted Milk is best known as the flavor that gave birth to every Malt Shop, Soda Fountain, Diner and Lunch Counter all across the USA. It is that. But times change. It’s still got that fine and sweet finishing touch flavor. But Malted Milk also offers something else. Made from malted barley, wheat and whole milk, it’s a natural, completely natural, preservative. That means our (your) cookies stay soft and moist for a long, long time. No artificial preservatives needed. Just an all natural way to deliver the wonderful flavor that it is. So, Malted Milk in a cookie? The way it was meant to be. (6) Chocolate Chip (6) Mocha Chocolate and (6) Double Chocolate. (12) Chocolate Chip, (12) Mocha Chocolate and (12) Double Chocolate. Malt Shop Cookies made with no artificial preservatives are the perfect holiday treat! As a mom of 4 and someone who is heavily into health and wellness I try to eliminate artificial preservatives whenever possible which is one reason that I really love these cookies from Malt Shop Cookies. Another reason I love them is because they're incredibly, incredibly soft. When I bake cookie I always under bake them a bit because I love cookies that are soft. I'm also huge huge fan of the malted flavor. Malt Shop Cookies are incredibly delicious and would make an absolutely wonderful gift this holiday season! 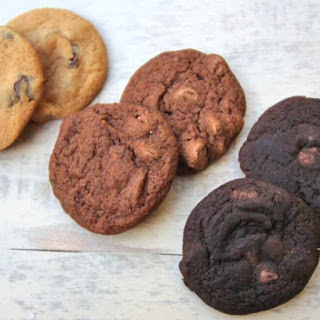 Click HERE to learn more about Malt Shop Cookies! Follow Malt Shop Cookies on social media!